(Nanowerk News) Energy from hydrogen – scientists from all over the world work on this solution to overcome the energy crisis. Amongst other things they try to use the sunlight as driving force for the splitting of water into hydrogen and oxygen. In trying to copy the photosynthesis in the laboratory a team of scientists of the Universities of Jena and Erlangen-Nürnberg and of the Institute of Photonic Technology (IPHT) in Jena (Germany) made a huge step forward. The physicists and chemists were able to prove in their tests, that the first step already affects the efficiency of hydrogen generation. "This is as if you would decide about where you´re going to by turning the ignition key in the car," says PD Dr Michael Schmitt from the Institute of Physical Chemistry (IPC) of the University of Jena. To put it scientifically: "The Franck-Cordon-point has to be created in such a way that the initial process of transferring electrons already points into the direction of the catalytic active centre." The results were published in the science journal Angewandte Chemie Int. Ed. ("Photochemical Fate: The First Step Determines Efficiency of H2 Formation with a Supramolecular Photocatalyst"). In their tests for a more efficient energy conversion the scientists focus on chemical photo catalysts. With this light is being used to let electrons "jump" well-directed from one subunit of the molecule to the other or to transport them over a ligand, which is a "bridge". These are scientists Dr. Stefanie Tschierlei and Dr. Michael Schmitt working in a spectroscopy laboratory of Jena University. Like the photosynthesis this process, which the chemists run in the laboratory, works in two main steps: A special metal complex with Ruthenium as its main component serves as an antenna which harvests the light. The Ruthenium then transfers an electron onto the reaction centre. The core of the reaction centre is a Palladium atom. At this metal centre the hydrogen is finally generated. But other than in nature not all electrons reach the palladium centre from the Ruthenium in the laboratory construction. Some choose "detours", some enter "roundabouts" or "blind alleys" and thus are being lost for the reaction. "Supported by resonance Raman spectroscopy we were able to watch and see where the electron ends after directly after the photoexitation," describes Prof Dr Juergen Popp, director of IPC and IPHT. "Thereby we were able to develop a new synthesis paradigm", Michael Schmitt adds. 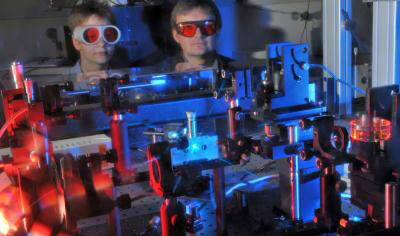 The team of scientists could prove that the efficiency of hydrogen generation depends on the light wavelength. It is more efficient the redder the light used for photo excitation is – light of a wavelength of 550 nm is ideal. "The redder the light the more electrons are transferred to the ligand, that connects the Ruthenium with the Palladium", Schmitt says. Moreover the initial absorption step decides where the electron goes and thus how effective the generation of energy is. "This knowledge enables us to put up well-directed barriers so that the electrons don´t take a ,wrong turn' but exclusively end up at the Palladium", says Prof Popp explaining the application potential of this fundamental research. In the laboratory the hydrogen generation is four times above former data but still far below the necessary rate. Now it is up to the chemists, like the participating Prof. Dr Sven Rau, to optimize the molecular catalysts, that "no electrons will be taken on by terminal ligands," as Schmitt explains. The scientists know that it is still a long way to go to copy the photosynthesis of nature correctly and efficiently. "But due to our spectroscopic analysis we took a huge step on this way", Prof Popp is sure though.